Lit with matches on a brisk evening, accompanied by water. Pre-Light - Smells of raw tobacco and hay, and sports a splotchy, smooth, leathery wrapper. Pre-light draw is fairly loose. First Third - The first third, starting with the uncut foot, begins with some mild cedary spice, leather, wood and some hay. The spice lingers in the back of my mouth. Once the wrapper starts to burn, the flavors begin to round out and become heavier/more complex. Draw is light but not too light, and the burn is fantastic. Second Third - The strength has began top pick up a notch, and the spice has cooled down a bit, though it is still there. Flavor-wise there is a bit of chocolate/molasses sweetness, leather, hay, and developing earth notes. Not the most complex, but very enjoyable. The draw is still going well, and the burn is fantastic. Third Third - Flavors continue to be similar to the second third, though both body and flavors have dipped in strength just a notch. Though still not particularly complex, the flavors meld together in a tasteful manner. The finish is quite dry (as in wine) which adds a nice touch. I can taste a tiny bit of bitterness which I will attribute to youth until further exploration down the road. Conclusion and Score - As usual, I was not disappointed by Pete Johnson's spooky Halloween offering. The dress box was well detailed, the cigars themselves quite a treat to the eye, and the smoke itself a memorable experience. I am definitely partial to LE smokes, the Monsters specifically, but there is no denying the richness of the spice, wood, leather and subtle sweetness that the Wolfman delivers. Pile on the solid construction, and you have a winner. The mild bitterness toward the end of the cigar is my only fuss, though I think with time this will fade. Overall this Monster gets a 91 in my book, though I have no doubt it will get better with even a few months of age. 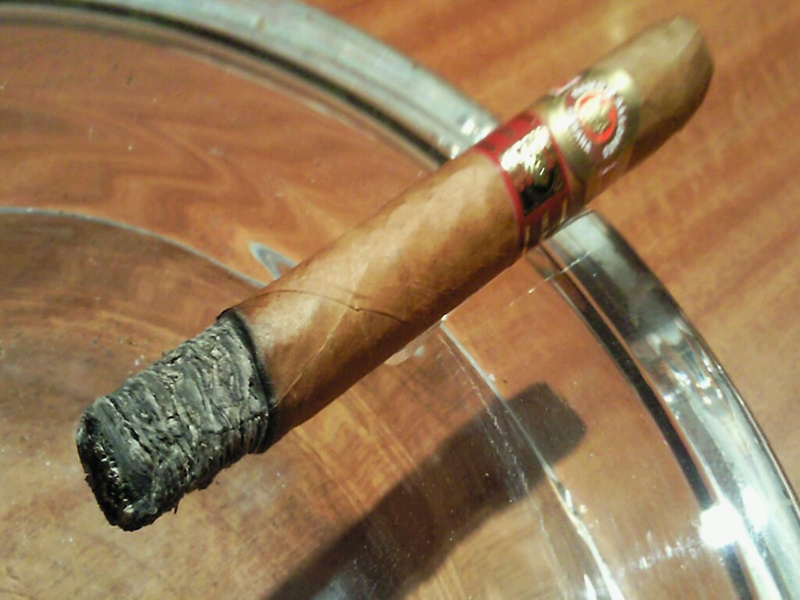 This special Opus size was released by Fuente around Christmas time in 2009, a renamed 'Love Story' which had been a 2008 release of the same size to commemorate Carlos Fuente's 55th wedding anniversary. It is a fun little shape (WOA like) and I am looking forward to lighting it up after a long week. Haven't had an Opus in a while so this should be a treat! -Starts with a blast of Opus-y wood, leather, and after you get past the little nub, SPICE! -Nubbed till my fingers burned! For my first recent Opus, this more than satisfied my taste for Fuente's best line. The size of this little stick was quite fun, and displayed perfect construction throughout. The body was on par with other smaller Opus sticks (less than a Power Ranger though), while the flavors were nothing short of deliciously complex. With the signature Opus spice, wood, and leather, along with some sweetness and espresso, this cigar has me kicking myself that I didn't buy more when they came out. Easily worth 94 points. Not sure how these were when they came out, but as most Opus lovers know, they get much better with age. After only two years though, the Love Affair has become a very memorable cigar. ***Pics coming soon, I forgot my camera at home! I was recently gifted this tough to find old stick by a SOTL, and thought it would be perfect for my first review in a while (life has been beyond hectic lately..). The Ninfas has a cult following since being discontinued in 2002, but suffer from occasional draw problems I've heard. Though I am not a big fan of Punch CCs, I am expecting this cigar to be pretty good! Sitting out back tonight with a glass of water. Cut with my Xikar and lit with a torch. Pre-light - The smell is mainly notes of hay, and the pre-light draw is the same. The wrapper is a light golden Colorado with some tiny veins. First Third - Though the draw is on the tougher side, the initial flavors are am elegant mix of medium bodied hay, chocolate, and some spice in the finish. Unmistakably Cuban. The smoke is fairly thick for such a thin gauge, and the ash doesn't last too long, though that is to be expected. Second Third - This third has a bit more spice to it, with the same hay flavor and some earthiness as well. The draw leaves a bit to be desired but it is definitely smokable (I probably should have dry-boxed). Loving this stick! Third Third - Draw has loosened up now, and the flavors continue to be hay, spicy pepper, and earth. The finish is long, with lingering spice. Perfectly smooth up front all they way through the finish. An almost malty flavor pops up towards the end. 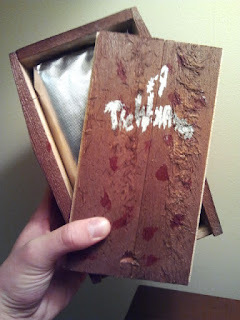 Conclusion and Score - I can totally see why these cigars are so sought after. Minus some draw tightness, this thing has it all- flavor, a smooth texture, a lasting finish, and that definitive Cuban tastiness. I would rate this a 93, with room for improvement mainly in draw. Not the most complex cigar out there, but a true jem for CC and thin gauge lovers alike. I received this stick a while back after a trade or box split of some sort, can't exactly remember but thank you whoever sent it! I've been itching for some mild Cuban flavor lately and figured this should do the trick. Despite the 'issues' with '99-'01 CCs, I expecting this to be a good smoke, but we shall see! Cut with my Xikar while sitting on the front porch, drinking water and some bourbon. Lit with matches. Pre-Light - Very light caramel wrapper, a nice tug on the draw with minimal cold draw flavors. First Third -Initial flavors are very mild, with a floral/vegetal notes and a bit of cedar that hits the back of your throat. 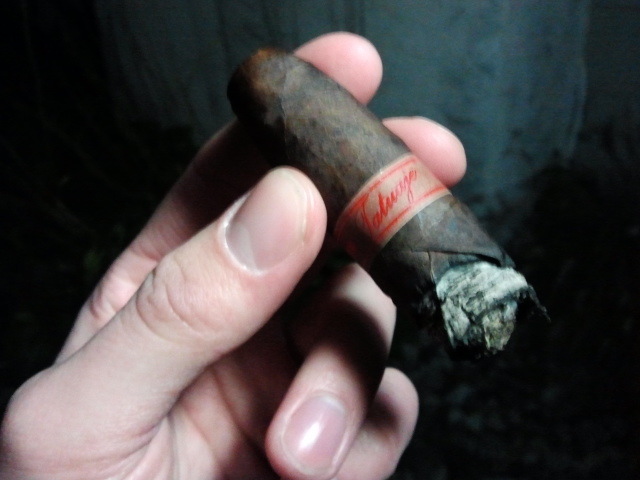 Definitive Cuban flavors, though quite mild even for a HDM. The draw has a typical CC tug, and construction seems solid thus far. I immediately realized that the bourbon was much to strong for this stick on its own, and resolved to drink some water after each sip. This is definitely a morning coffee habano. Second Third - Similar flavors to the first third, with a more grassy flavor now. The construction is still solid, though the ash doesn't last too long, maybe a half inch before it becomes brittle. Third Third - Can't say there is much more going on here. As the smoke comes to the end, the flavors are mainly the grassy and 'garden' notes from the first and second thirds, as the cedar has all but dropped out. Construction continues to be spot on. Conclusion and Score - This would be a great relaxing smoke with some coffee, sitting on the porch in the morning. Not to say it was too mild, but this was definitely very light in both body and flavor, earning an 84 from me. I wouldn't hesitate to smoke this stick again, but it was much too light for me to make regular visits. Basically a perfect 'background' smoke if you know what I mean. I have always loved this stick, from the first one I smoked a few years ago. Right after I realized how much I liked them I was able to pick up an almost full box of '08s from a BOTL on the forums, and have enjoy them periodically since. Now that I'm getting down to the end of the box I figure these deserve a review, so lets see how one of my favorite everyday sticks does! Smoking outside tonight on the porch (it has been raining all week.. blah) with a glass of water after a beer. Cut with a Palio, lit with matches. 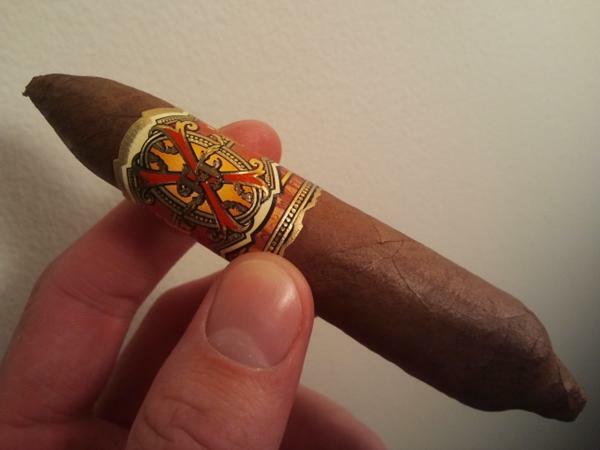 This cigar has it all- interesting flavors, great balance, and fantastic construction. 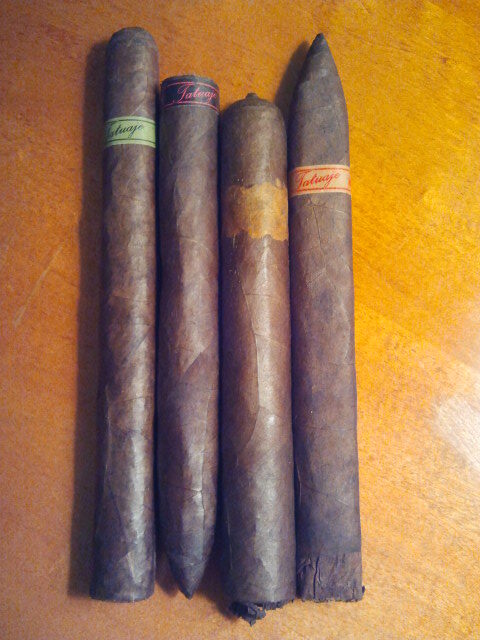 I love oval shape, the leathery rough wrapper, and particularly the dark coffee and tobacco flavors. Age has certainly treated this stick well; the body has gone from full to medium+ but the flavors and finish became creamy smooth. My only issue was a bit of nicotine-bitterness at the end, though this is to be expected with many beefier Nicaraguan sticks. Definitely worth a 93 point rating, and I so wish I had more! A while back when these were released (since, there have been 3 new vitolas in the S&B line) I picked up some of these limited release Viajes with the intention of doing a 'new stick' type of review. I ended up forgetting about them for a while (always a good thing with cigars) and figured I would do a 'Where are they now?' review. I'm looking forward to seeing what the stick, released as a powerhouse of nicotine in a small package, has turned into after almost a year of humidor time. Pre-light - This small vitola has a rich chocolate wrapper with a very smooth feel. The pre-light draw provides a bit of tug and some mild sweetness. Second Third - This third find the flavors mellowing into a complex, creamy fusion of leather, wood and cedar. Construction is still great, as with most Viajes I have found, as the ash held over an inch before I clumsily dropped in on my white shirt. It could just be the massive hunk of delicious cow I ate for dinner, or the humi time, but I'm honestly not feeling a huge nic-kick thus far... Not that that has any bearing on the quality of the cigar. 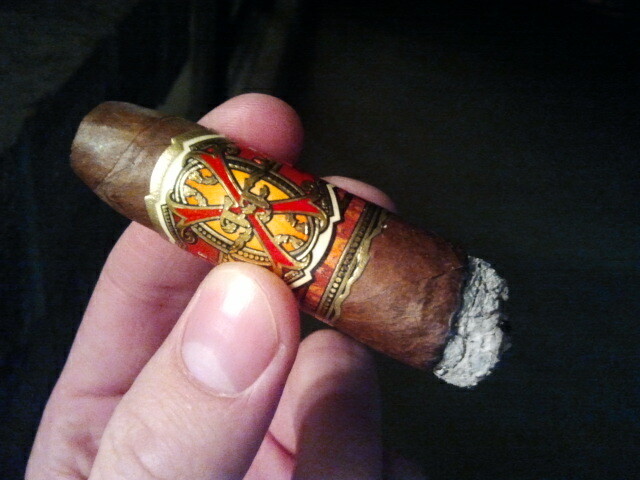 Third Third - I must say the progression in this cigar is awesome. It has finally hit full-bodied, and not just with a tap- the strength here is pretty apparent. The flavors in the last third come out of their shell a bit from the last third, but remain fairly consistent, though there are a bit more spice and tobacco notes. The last whole third is so rich and complex I wish it had been longer! Conclusion and Score - Granted I haven't been smoking much lately because I've been crazy busy, so anything would be at least somewhat enjoyable, but this cigar was absolutely phenomenal. The flavor profile was rich, complex, and full, while the construction was perfect. While it was a strong little stick later on, it wasn't the beast I was expecting. 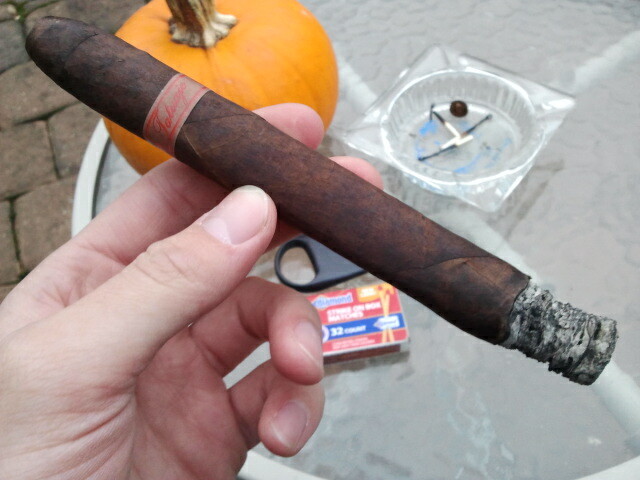 But nicotine bomb or not, no question this was a great cigar and worth 93 points in my book. PS I remember Brooks from SmokingStogie.com saying that this stick and the similarly sized/strength Tatuaje T110 (which I reviewed a while back, one of the few sticks I hoard) were totally different, and he was spot on. 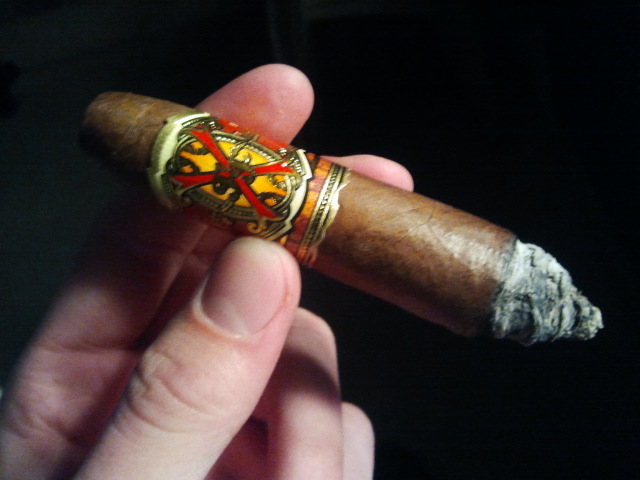 It's a bit chilly out tonight, but not bad enough to stop me from enjoying a cigar. Lighting with matches for a change tonight, and drinking water. 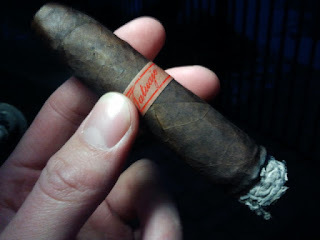 Pre-light - A very rugged, leathery wrapper covers this smoke, in a dark, almost black color. The pre-light draw is light and gives a ton of sweet tobacco. First Third - The easy draw gives way to tons of smoke, and boasts a cedary spice over sweet tobacco, leather, and coffee. The flavors are much fuller in body than I had expected and lie between medium and full at the moment. The Cazadores' texture and flavor notes seem to remind me a bit of the Drac, though not as complex. Though the draw is on the lighter side, the burn is sharp and the ash (though looser) stays on well. Second Third - The spice has died down, leaving more leather and some chocolate in it's place to mingle with the coffee and tobacco flavors. The body has mellowed out a bit now, as the flavors start to blend together more. D/A/B are still great. Third Third - The flavors have stayed fairly consistent from the first third, though I'm getting a bit of bitterness here and there. Not a huge turn off, but for the sake of full disclosure... The construction is still great, and the coffee notes are hitting the spot right now. Conclusion and Score - I enjoyed this cigar, as it had plenty of tasty coffee, cedar, and tobacco notes. 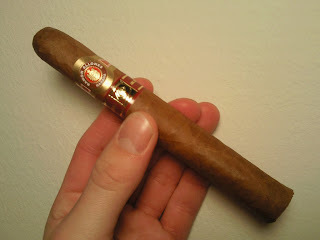 I can't honestly say that it tasted like exactly like Cuban tobacco, but there were some hints of 'Cubanesque' flavors. The construction was immaculate and the wrapper had a nice rough, leathery feel to it. I would give this stick an 89 rating- if the bitterness towards the end had been absent (might have to grab some for aging to see), it could easily break the 90s. Headed over to the shop today to enjoy a smoke, and decided to have something out of my 'good stuff' stash and picked out the Ramon Allones Superiores from the 2010 La Casa del Habano release. This cigar is a Corona Gorda a with a beautiful, leathery, light brown wrapper, and only had a production size of 5000 boxes of 10. 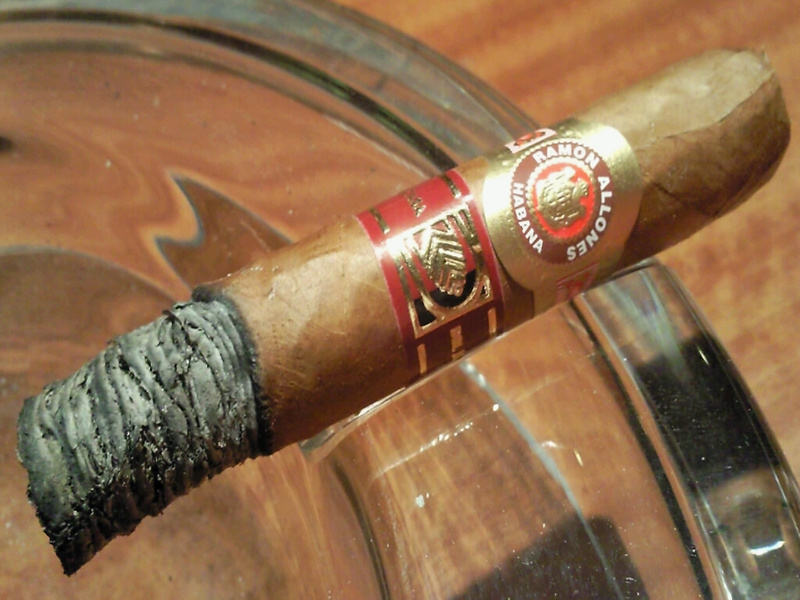 As a lover of all things Ramon Allones and Corona Gorda, I'm really looking forward to this smoke! Pre-light - Not much smell, but a bit of sweetness and grass. The draw has a perfect tug to it. First Third -The Superiores starts out with a blast of hay, leather, and creamy coffee it a fitting light-medium body. The draw is fantastic with thick smoke and a very nice dark gray ash. About a half inch in some heavier leather and coffee flavors come out, though balanced by creaminess. Second Third - There is a bit of spice and nuttiness in this third, combined with the still tasty creamy coffee and some hay. The body is still medium-ish and the construction continues to be spot on. It is an effortless, tasty smoke! Third Third - The flavors in the last third are similar to the second, with a bit more sweetness added to the coffee, leather, nut and creamy flavors. Definitely a complex combination that flows together perfectly. Construction is great, and the draw produces a cool smoke even to the nub. Conclusion and Score - I absolutely loved this cigar. The rich, complex mix of creamy and hay flavors with the darker nut and leather notes created an exquisite experience. Certainly not as full in body as the regular production RA, the Superiores was light-medium, though not losing anything in the flavor department. I'd love to see these become a regular size, as I loved the size of the stick (and obviously the flavors.) For me this was worth a 94 point rating, one of the best I've had in a while! Earlier 2010 (last year now!) 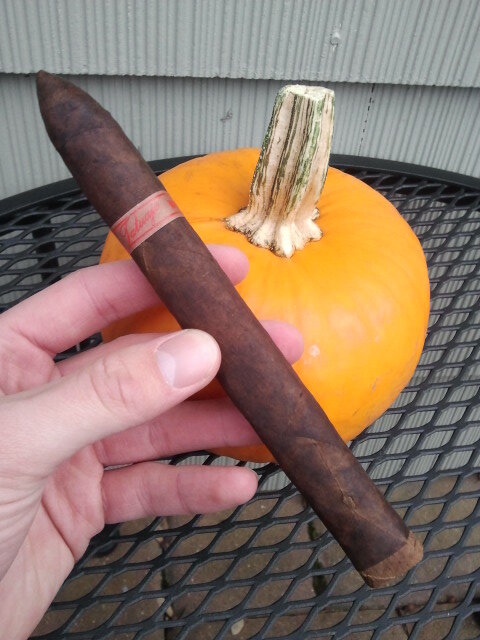 Pete Johnson of Tatuaje blended a 'secret' cigar called the Anarchy for Smoke Inn in Florida. Details about the sticks were leaked over time through Pete's Twitter and Facebook, and the sticks were fully released for sale in early December. Some are still available, but it is a limited production cigar so they won't be around too long (though not as limited as the Halloween releases). The shape is an interesting figurado hybrid- tapered at both ends but a larger gauge at the foot. It also sports an interesting pigtail and a very dark Ecuadorian wrapper. I have read a few reviews, ranging from good to excellent and am looking forward to seeing for myself! Thanks to my awesome brothers at CS, I received a whole box for my birthday, and since that is tomorrow, I figure it's time for a review! Pre-Light - The wrapper is a beautifully dark chocolate color that is plenty oily. It smells of a creamy tobacco, and the pre-light draw is medium with some sweet notes similar to the Drac when it was first released. First Third - The first puffs crackled (odd, I know) with a full bouquet of leather, wood, oatmeal and some mildly spicy earthy notes. The body seems to be lighter than I had expected but the flavors are certainly full. The draw has a perfect tug, and the burn is very straight so far. The initial blast of flavors cools down to a relaxing (but not boring) profile after an inch, dominated by leather, wood and some cream. Second Third - The individual flavor have morphed into a concoction tasting of woody leather with some molasses. The D/A/B have all be great so far with no need for touch-ups. Though still quite tasty, there are puffs in which the flavor is muted, something I have seen other reviewers note... not sure if this is just a fluke of something age may iron out. Third Third - Similar leathery wood flavors to the second third with a bit of nutmeg in the background in this third. The D/A/B have been consistent throughout and I am really enjoying this cigar. Definitely worthy of nubbing. Conclusion and Score - I love the leather and wood flavor of the Anarchy and the other notes that popped up throughout. The construction was top notch, and the size quite fun. Looking forward to seeing how these will age as they seem like a great candidate. I would rate it a 92 with a possibility for some more points if the small kinks in the middle can straighten out... great stick now though too, track some down! This new size from Tatuaje, smaller than a Petite Corona at 4x40, sports the Broadleaf wrapper that Pete Johnson has had so much success with. It has a wrapped foot (which I am a huge fan of) and should be the perfect size for temperatures in the 20s! Lets see how it smokes..
-Ash held for over an inch! Can't wait to pick up some more of these (cab worthy! ), loved the complex, full bodied, dark flavors in this little guy. Great smoke in a small package, and with a cup of coffee- the breakfast of champions! I bet these will be great with age.